You must be a member of the Washington, D.C. Adventure Group to attend this activity. Would you like to join this group? Hi all! Hope to see you at this event!!! Afterwards we'll grab drinks somewhere in the neighborhood. "Do you put away all your camping and backpacking equipment sometime in November, hunker down, and wait for April before you take it out again? If so, this talk is for you! 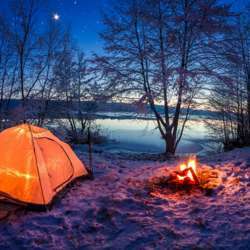 Camping and backpacking in the fourth season may not be for everyone, but it can be rewarding. With cold weather comes solitude and an experience of the outdoors that’s profoundly unlike the warmer seasons. Join Michael Martin, author of AMC’s Best Backpacking in the Mid-Atlantic and AMC’s Best Day Hikes in the Shenandoah Valley, to learn more about how to safely camp during the winter. He’ll discuss the skills needed and will bring a selection of gear for people to try out. You may quickly discover that winter is your favorite season."